Habanos s.a. announces the dates of the 15th Habanos Festival to be held in 2013. Habanos, S.A. is pleased to announce that the 15th edition of the Habanos Festival will take place from February 26th to March 2nd 2013. Exceptionally, the Festival will be celebrated form Tuesday to Saturday. In this next occasion the Welcoming Night will be Tuesday February 26th, and the Gala Night will take place in Saturday March 2nd. 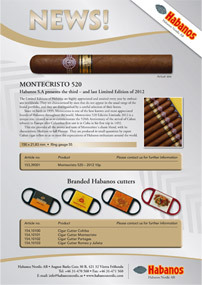 We recommend you to take this circumstance into account, and to visit regularly www.habanos.com from November 2012, where you will find the detailed program of the event.